Click on the book to flip through it at Amazon. 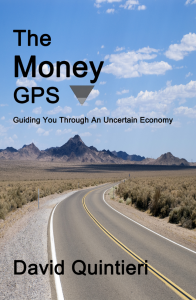 The Money GPS is available in paperback or Kindle format. The government structure is setup to enable corporations to lobby (bribe) our “representatives” and pass laws that are often criminal. As a result, we have a CATASTROPHE on our hands. Derivatives exceeded $1.5 QUADRILLION in total value which far surpassed the GDP for the entire world–25 times over! David Quintieri brings information of this magnitude to his readers and teaches them how to prepare in times of uncertainty. Utilizing his ability to deconstruct any complex system and turn it into a simple and readable format, his work becomes an important tool for a wide audience.